Steph was born and raised in south St. Louis city is pretty darn proud that she still lives there to this day. Her love affair with the Lou is only slightly longer lasting than her love for design, which started in high school when she took a packaging design class. After that class she found herself paying more attention to package design, layout, and typography of different products and her full-blown design addiction began. Steph received her BFA at Southeast Missouri State University with an emphasis in graphic design. While at SEMO, she learned that she is a design/art nerd and realized there was no going back. 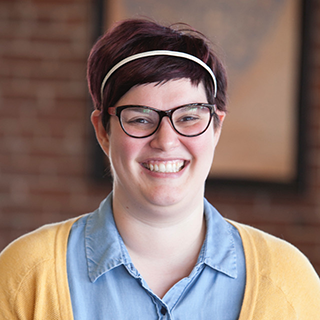 Since graduation, Steph has worked on a myriad of projects and with several large St. Louis agencies and has made long-lasting friends along the way. She wouldn’t have it any other way! Steph’s hobbies include going to concerts, listening to vinyl on her new-ish record player, playing the drums, hanging with her nieces, enjoying patio weather with a nice brewski and riding her bike in the ever-changing St. Louis weather.